When it comes to your wardrobe, nothing makes you look more stylish than an elegant pair of dress shoes. Every now and then an opportunity arises which calls for this particular item. It might be the wedding of a friend or even a special date with your loved one. Regardless of the occasion, one thing which can make or break your wardrobe is a nice pair of dress shoes. It doesn’t matter how good your pants are, or how well-ironed your shirt is, if your shoes aren’t up to the mark, impressing your audience will be difficult. If you’re looking to find out all about dress shoes, you’re in the right place. Like with most other purchases you’ll make in your life, when it comes to quality you usually get what you pay for. High-quality dress shoes are all about comfort, style and elegance. In order to achieve all three of these qualities, you should expect to spend a bit more than you would on casual shoes where the primary focus is usually on comfort. With many lower-priced shoes, you won’t be able to achieve a similar level of the three qualities that you’ll want in a dress shoe. There is a large range of pricing options on the market today, so it’s important to consider how much you’re willing to pay for a decent pair of shoes. It can help to do some preliminary planning to get an idea of what kinds of prices are out there for dress shoes that look like they’ll fit your needs. At that point, you can decide to save a little more for the ideal pair or decide on a limit to what you want to spend. This is going to be up to your particular budget and situation. Once you’ve decided, you can start shopping. It’s best to do it in person so that you can try on the shoes, but you can also choose to shop online if that’s what you’d prefer. If you want a pair of premium dress shoes, go for ones made of leather. As well as the shoe’s upper part, the soles should also be made of genuine leather. The reason is that even though they might be expensive at first compared to their synthetic counterparts, they will last for years to come, so you won’t have to purchase another pair in the near future. Another thing which plays a key role in enhancing the durability of dress shoes is the construction of the sole. If the sole of a dress shoe is glued to its bottom part, you shouldn’t hesitate to move on to the next pair. If you find the sole is stitched to the bottom of a shoe, this is an indication of its quality. You should always purchase dress shoes which come with a thicker sole. Unlike thinner soles, which tend to wear out pretty quickly, a thick sole stands tall against regular wear and tear for an extended amount of time. Hence, if possible, avoid dress shoes which come with a thinner sole. Purchasing a pair of shoes that are decent quality can ensure that you’re able to get use out of them for a longer amount of time. While it can seem appealing to purchase a cheap pair of shoes to save money, there is more of a chance that they may break or begin to wear down much more quickly than a solid pair. A great pair of shoes can last years before you need to replace them, which makes them better value in the long run. For those who don’t like to have to shop for shoes too often, a highly durable pair can be a great solution that can help you avoid spending more than you need to. It’s no secret that when it comes to quality dress shoes, a lace-up closure is always more elegant than a slip-on design. Especially if you’re looking to wear them for a business meeting or a job interview, a lace-up dress shoe style will do well to enhance your wardrobe. If you choose to go for an option with lacing, then you’ll want to make sure you know how to tie the laces well. Having laces that frequently come untied or just look sloppy can really bring down the level of elegance that others see when they look at your shoes. Having a backup pair of laces can also be useful, as shoe laces can wear down a little more quickly than the rest of the shoe and sometimes wind up looking dirty if they are of a lighter color. Grabbing an extra pair of properly colored laces when you buy the shoes can be a good idea. Dress shoes are normally available in two different colors: black and brown. While both of them look stylish, the black variety is generally the more favorable choice for most occasions. As well as wearing them to a board meeting, a stylish pair of black dress shoes looks extremely sophisticated for any formal gathering. As per the brown-colored dress shoes, they require a special dress code to work. For example, if you’re going to wear a charcoal-colored suit, a pair of dress shoes in a stylish brown color could be an excellent choice. There are some cases where you can get color options outside the standard black and brown. These can be a little more difficult to pair with outfits for the ideal overall look. If you have a matching suit, that can be a great idea. Otherwise, it may help to seek out some professional advice on pairing certain colors of shoes with the right outfit. This is an important thing to know so that you don’t go into a formal event or interview sporting a fashion faux pas. Broguing generally refers to the addition of decorative stitches on the upper portion of a dress shoe. These are basically serrated stitches which imparts a unique touch to this footwear. According to various fashion experts, you should usually purchase a pair of dress shoes which come without any sort of broguing. The reason being is that often as the shoe’s stitching diminishes their appearance can be seen as being worn out where in fact they may be only several months old. That said, there are many who choose to sport this look as a fashion statement. There are a number of different styles out there. Some have a lot of broguing while others only have a select few spots to create a certain style. One style that often displays this type of design is the wingtip shoe. If you’re looking for a more decorative option like this then it will be a good idea to make sure you have great outfits to go with the shoes. There are two reasons why dress shoes are such an important part of your personality. Style-wise they can either make or break your outfit. And, regardless of what everyone else says, people that matter both in your personal and professional life will notice. Looking classy and well-put-together never goes out of style. 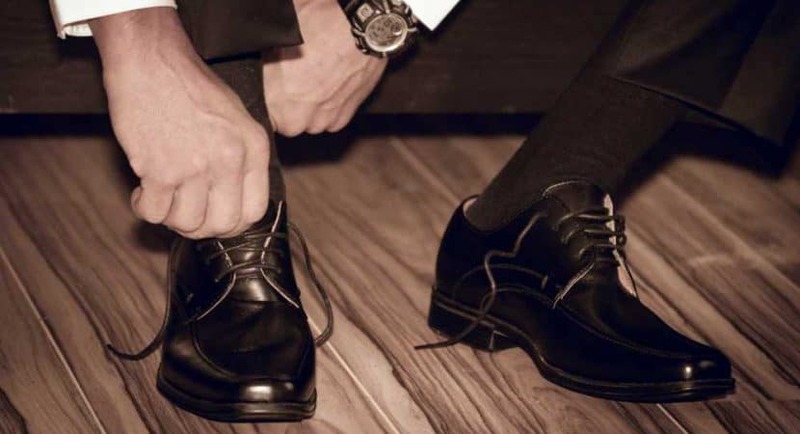 So, before investing in a pair of dress shoes, remember the three quality traits that you’ll want your shoes to have (comfort, style and elegance) and make your purchase accordingly.